My assistant Bethany and I are baking. Lots of baking. We are making desserts for a benefit concert and dessert buffet and for a dessert auction. We are discovering some new things we like and some new things we don't. We like piping the frosting onto the cupcakes. We like these pumpkin bars. We may even need to make another pan. Bethany doesn't like red velvet cupcakes. I can take them or leave them. But we both love the cream cheese frosting. We also love these cupcake cups. I was loading some photos that Patrick scanned from my grandma's slides a couple of years ago, after she died. 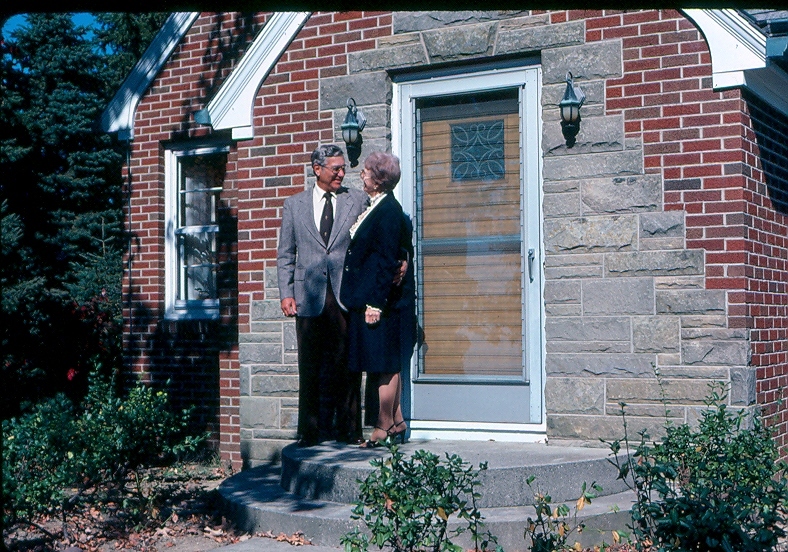 I came across several of my grandparents that reminded me why they always were--and always will be--who I think of when I think of a happy marriage. They were married for a little over 70 years, and there was a look that I remember Grandpa giving Grandma when I was five, that I was still seeing him give her when I was 40. I also don't like to deal with financial things. I like to spend money, and I'm happy to earn it, but I don't really like to think about it too much. So, of course, I'm our church treasurer. And I do a good job. As long as everything goes along as expected, it's only moderately painful. A former church secretary with an accounting background set up our system, and it works very well unless something changes, but it is complicated. Because of some changes, I have run up against a convoluted accounting issue that has had me pulling out my hair. I thought that I had a solution, provided by someone else with more knowledge than I have, but that solution only twisted things up more. Yesterday I figured out why. And in that moment was grateful for my one semester of accounting and the fact that I understood--kind of--how different accounts work and why things were messed up. But knowing--intellectually--what the issue is and knowing how to fix it are two different things. Last night I talked the issue through--out loud--with my mom and then with Bethany and made some headway. One idea that I came up with while I was talking to my mom is to draw some pictures, so that's today's plan. I'm going to draw a "map" of what the stupid numbers mean and I'm going to hope that it gets me to my destination. So, while waiting in the green room I heard one mom talking about a guy she saw driving down the road talking on one cell phone and texting on another. This morning on my way to work I saw something that beat that. I saw a guy talking with a blue tooth, texting, and SHAVING. Yes, shaving. Labels: Fort Wayne, Things that make you say "hmmm...."
So, redecorating the blog has lead to some revisiting of links. I'm working on getting my blog roll updated. And I checked out my To-Do List. I did manage to eliminate a couple of items, but only because I don't want to do them any more. According to this list, the last couple of years have been a total bust. But for some reason it just doesn't bother me much. Wait! You want me to work? I mentioned last week that I spent a couple of evenings sitting in the green room waiting for Jonathan, being apparently invisible, overhearing lots of conversations. I was trying to read my book, but there was one woman in particular who seemed to want to be sure that every single person in that very large room was listening to her. And I was about five feet away. Her first topic was the job that her daughter had recently quit at a moderately high end accessory store because she felt like they were making unreasonable demands. My attention was caught because I am well-acquainted with the store and the employees. It has extremely low turnover; there are several people working there who have been there for six or seven years. This daughter, who is 20 and "had a little trouble" and is "taking some time off" from college, quit what can only be described as a pretty cushy gig--as retail goes--because she was expected, on the nights she closed, to clean the bathroom. One toilet, one sink, one mirror. And her mother agreed with her that that was an unreasonable expectation. The mother went on to complain that many nights her daughter ended up spending half of the evening "dusting and straightening." And she didn't "raise her to grow up to be a cleaning lady." Plus, "she just wasn't having fun." Oh, where to start? How 'bout with the attitude that certain work is "beneath" a person? I have heard this quite a bit in the last year, mostly from young people or their parents, but also--more than once--from Boomers. I find it unfathomable and more than a little annoying. Unfathomable, at least in part, because it was ingrained in me that, if you need money, you work. And that all work, done well, has value. Work is good; not evil. I probably react somewhat on a personal level, too, because I have done the jobs that so many spoiled teens and self-important Boomers seem to find distasteful. I've worked fast food (and cleaned the bathroom.) I've worked in large and small retail establishments (and cleaned the bathrooms.) I worked in the college food service, much of that time in the dishroom. I've worked in a movie theater (and cleaned the bathrooms.) I bartended and waitressed and cleaned LOTS of things worse than a bathroom. I've cleaned houses. Oh yeah! I almost forgot: I was a real estate agent for three years, and in our smallish office we all took turns cleaning the bathroom. Right now, I'm fortunate. I have a part time job as our church secretary that is mostly fun. I'd rather not have to work, but it is paying most of our oldest son's college tuition, so it's worth it. But, if our circumstances changed, I would do what I needed to do, including clean toilets. I don't believe that there is never a good reason to quit a job. I quit a pretty cushy one once because my boss wanted me to lie to customers. I encouraged my daughter to quit one because she had an abusive boss and it was affecting her health. But bringing kids up to think that they are too good to do certain work isn't doing them any favors. More from the green room next post. I was going to say I love this kid, but changed my mind. Although he's MY kid, he's not a kid any more. I'm pleased to say that he's one of my favorite people and I am very pleased and humbled by the person he is growing up to be. Besides that he's a darn good writer. I'm hoping that by posting this here I will remember in the spring, when I don't feel like tilling and planting, and in the heat, when I don't feel like weeding and planting that second round, why I have a garden. Tonight's dinner was yet another marvelous collection of garden goodness. We have had so much wonderful pesto this summer. We have had zucchini sauteed, in cookies, and--as it was tonight--in pasta. Tonight we added a red pepper from the garden and, garlic from the farmers' market, and some of last night's leftover chicken. Last night we had roasted chicken accompanied by roasted beets, turnips, and carrots from the garden. We've had cukes on our salads, and tomorrow night we'll have a cucumber and yogurt salad with some korma. Early in the season we had many wonderful mixed green salads and hope to enjoy a second round this fall. In the meantime, we're about to get the first of what promises to be a flood of tomatoes. It is so worth the work. So worth it. I think I've established before that I'm a bit of a tree freak. I have fallen in love again. The Vanderbilt University campus had all sorts of lovely trees, but these magnolias were my favorite. 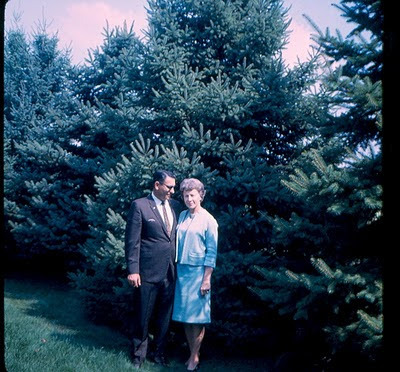 This picture with my friend Nancy in it gives you an idea of just how big this tree is. Most of the blossoms were gone, but I was able to get a picture of one tenacious flower. Yes, I know. I know. I haven't been here in months. The old blog has been sorely neglected. Maybe it's because I'm in the midst of so many creative or semi-creative projects right now, but I feel like writing. I'm getting to do my favorite kind of cooking right now: ad-libbing with what comes from the garden, digging up new recipes, or making it up as I go. We brought home 29 pounds of blueberries. We have frozen a nice chunk of them, made a batch of Boy Bait, taken a few to friends, and today is a little jam for Andrew. I would like some more berries, but Patrick started his new job this week, so he isn't available to drive the boys up to the patch. I guess I'll just need to be satisfied. We've have a nice amount of zucchini, with more coming. The beets have been delicious, greens and all. I'll be roasting some turnips while Colin is gone, since he doesn't like them. Tomatoes are about ready and I think I'm going to have a lot this year. I hope so! Two weeks ago we were in Nashville for the Higher Things Conference. Two weeks from today is the start of our family retreat at Redeemer, and we still have some work to do. After that, I'm going to take a couple of weeks to focus on projects around here with an eye to having the house on the market by the end of August. The Obsessed with Scrapbooking blog is giving some cool stuff away to celebrate 1 million hits. I didn't even know that the Cricut Gypsy existed 15 minutes ago, and now I'm dying to have one. If you're part of the homeschool community you have probably heard by now of the hatchet job Good Morning America did on unschooling. If you haven't seen it, you aren't missing much. It was of the low quality that we have come to expect from the mainstream media. Of course unschoolers have, as you would expect, reacted with all kinds of posts about, and defenses of, unschooling. I have heard that GMA did a bit of a backpedal show the next day, but I have no desire to see it, so I won't address it here. And since I just wrote four posts last month more-or-less about unschooling, I am not going back over all of that ground. "In contrast "unschooling" means no textbooks, no curriculum, no tests, no grades." Um. No. Not even close. Maybe, in some families, but certainly not in all. In many, like ours,especially as our children get closer to adulthood, they choose to use textbooks. Our sons have chosen to use some curriculum. They have chosen to take some classes in which they are tested and graded. This has all been their choice in pursuit of their goals and interests. My two oldest took the SAT. Last time I checked that "T" stands for "test." The knee-jerk negativity to the outside-the-boxness that is unschooling is not surprising. But you'd think that if people are going to criticize they would at least get their facts straight. I'm almost embarrassed by how much I'm looking forward to this book. I love Jen Lancaster. Maybe it's because we are of about the same age. Perhaps it is the glimpses of familiar places and situations in her mid-western life. Or it could be that we both love to shop and eat and are basically lazy. But I think the most likely reason is that her books make me laugh out loud. Some of you know that I am the oldest of a bunch of cousins, 16 of us to be exact, and that I have cousins the age of my oldest kids. One of the Bethany's-age cousins is working at an orphanage in Uganda for couple of months and has been having all kinds of interesting experiences, but I think that the most recent one qualifies as one of those adventures most of us will, fortunately, never have. At least I don't think it's likely that I'll ever be arrested in Uganda. Last year I posted about wearing our hats to church on Easter. A picture of the ladies from Redeemer was in the local paper, and then later there was an article in The Lutheran Witness. 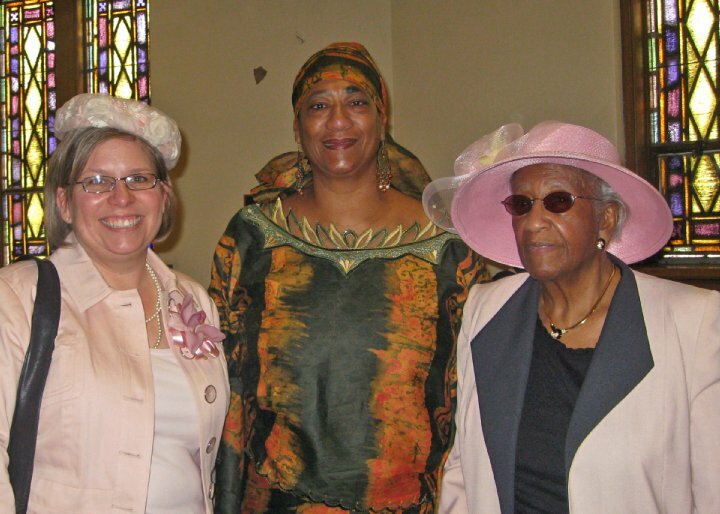 It has been fun this year to see friends at other churches talking about getting women to wear hats, and to hear from former Redeemer members who took the hat-resurgence to another congregation with them. Here's a post from one friend who has started the tradition at her church. I posted last year about how dangerous and damaging I believed the propensity of the Obama administration and the press to cry "racism" is. I still believe that. And I am not alone. I still believe that they are giving cover to real racists, but I also believe that their latest trick may have been an overplaying of their hand. We've heard, ad nauseum, from the echo-chamber media about those horrible, nasty racists shouting epithets at the congressmen passing through the crowd on Obamacare Sunday. And yet, two weeks later, still no proof that this happened, in spite of a multitude of recording devices. So were they faking? They are not likely to give up. Marginalizing conservatives, and especially the Tea Party movement is too important to their plans, and this has long been their go-to accustion. But at the same time, there seems to be a bit of attention being given--finally--to who Tea Partiers really are. No surprise to those of us who've attended a Tea party or two, they look a lot like America. Racism is evil. There is no other word for it. And using race--or the threat of being called racist--as a club to beat your opponent into submission, is a dangerous game. I believe that those on the left who continue in this path are not only giving cover to real racists but are also, in a very real and sick way, feeding their hate and encouraging them. Elephant's Child has a great post about waiting on formal math instruction. "Is it really possible for kids to grow up to be doctors or lawyers or brain surgeons if they do not learn in scheduled/controlled ways?" This is a question lifted from a Facebook conversation. I decided that the answer needed to be a blog post, because it was getting too long. Besides, Facebook conversations are fleeting things, and this question is not unusual. The short answer is yes. If that is what they want to do. My first reassurances came in the forms of my friend Susan's kids. A few years older than my oldest, they had been unschooled and were doing well in the world of work and college. That helped. As my own kids got older, I saw them each developing interests, devouring books, getting out of bed early on cold mornings for choirs, classes, and other commitments. When Bethany could see the SAT looming, she buckled down and did two years of math in a few months. She got awesome SAT scores and a full academic scholarship. She went to classes, worked hard, had a part-time job, sang in a couple of choirs, taught piano, and graduated with a 3.98 GPA with a major in history and a minor in English. This is a girl who was unschooled from fourth grade on. She devoured books, played with her brothers, watched movies, and played piano. That was pretty much her life for nine years. After graduation she was debating grad school options, but really wanted a break. Because of her writing skills, the history department let her know about a paralegal job that was available, which she applied for, and got. Oldest son, about whom you can read in my old blog posts was our second graduate. He was our reason for homeschooling. He was a delayed reader and has sensory integration issues. He is now a college freshman majoring in history, pre-law, with a 4.0 thus far. Both of them are FAR more disciplined in their studies than I was my first time in college. I left high school having graduated 10th out of something in the vicinity of 400, with all of the requisite activities and honors. I had spent my entire school life succeeding in the system, and yet I crashed and burned fairly spectacularly in my first shot at college. Our 16 yo--who has never known anything but unschooling--gets himself up every Sunday at 6:30 so that he can go acolyte at our early service. This has never been required of him. He chooses it. He sings with the Bach Collegium, just finished 10 weeks rehearsing for 3-4 hours a night and performing Joseph with the Fort Wayne Civic Theater, and this week winds up 12 weeks rehearsing for The Sound of Music with a local high school. He will graduate from high school knowing as much or more Biblical Greek as students at the seminary, and because we haven't been hung up on a school schedule he has attended many theological conferences with our pastor or at our church. Next year as a senior he plans to take a college class or two, just to get used to it and because they can also count on his high school transcript. He plans to become a pastor. Our 14 yo may just become a doctor. Or he may be an entrepreneur. Or a professor. He really isn't sure yet. He had no interest in anything even resembling academics until he was 12. He didn't even like to read. The rest of my kids have been readers, so that worried me. I needn't have worried. He reads like crazy now and doesn't like to leave the house without a book, his Latin or his Greek, and his algebra. He probably spent more hours watching musicals and playing with legos than any child in history. He will probably start college classes his junior or senior year of high school, but that will be up to him. I have normal kids. They are all definitely smart, but they aren't prodigies. They are just as stubborn and lazy as any kids on the planet. They did spend most of their childhoods doing pretty much what they wanted, except when I would make them help clean. But unschooling hasn't kept any of them from achieving anything, and I believe that it has helped them by allowing them to develop their strengths and interests and learn self-motivation. More from the questioner: "I want my children to be driven, motivated, curious, and smart. I want them to be able to argue, debate, and win!" You just described my kids. :) Seriously, much of that is parenting, no matter how you choose to school them. I believe that unschooling is more likely to produce curious, motivated kids if that is what the kids see in their parent's lives. Our kids have been surrounded by books and ideas. Our life is often one protracted discussion. I always made an effort to make connections between things--history, literature, current events, movies--so that the kids would grow up looking for connections. The kids used to watch me talk back to the TV, arguing with the news people or questioning the commercials. Now they do it, too. This post has been rattling around in my brain for months. It was finally shaken loose by some things Gatto said about school and family, and some conversations with friends. First: My kids are far from perfect. Those of us who are Lutherans understand this, but I felt like it was a necessary disclaimer given what is coming. This post is a response. It is a response to questions I have been asked many times, by different people. It is difficult to write, because I know the imperfections of my kids and our family. I don't have all of the answers. But these are the answers I have. The question has been some variation of,"Your kids are so nice/helpful/polite/well-spoken. You all get along so well. They all get along so well. They read all kinds of good books. How have you done it?" My first answer is, I've had a lot of help. In fact, in many ways that is my answer. The other is that I have resisted two urges that I have seen in the homeschool community, both of which are--in a way--reactions to the larger society. The first of these is the urge to control. The second is the urge to mimic school socialization. The urge to control comes out most frequently as limits on time spent doing various activities: Watching TV, playing with toys, playing with video games or on the computer, reading for pleasure, playing musical instruments, or just laying in the back yard daydreaming. The other form is limitation of content. We did this to a very, very small extent, mostly vetoing kids TV shows full of snotty attitudes. The urge to control comes in large part from the checklist idea of education as tasks to be completed. It places higher value on some activities than others in a way that is often arbitrary, based on some outside idea of worthwhile activity. My kids didn't have time limits. So one day they might have done nothing but play legos while watching musicals. On Monday Bethany might have reread Anne of Green Gables for the 15th time and played the piano for four hours. On Tuesday she might have spent all day playing Zoombinis and playing in the back yard. There were days on end where none of us left the Oregon Trail. In later years the boys might have spent six hours playing Age of Empires and then turned on the news. This post isn't about what they've managed to learn. That one is still to come. This is about why I believe they've become who they are. Here is, I believe, a huge part of the key. We didn't "do" "socialization." The s-word is the big bugaboo in the homeschool community. Everyone knows that homeschooled kids overall do well on tests, etc., but "WHAT ABOUT SOCIALIZATION?!" We've all heard it. Generally the answer is, "We have groups. We get together. Etc., etc., etc." We didn't. We didn't do homeschool groups. Or scouts. Or 4-H. Patrick's sensory issues made large groups of kids torture. Part of the time we lived where there were no groups that we were compatible with, when there were groups at all. Of course the kids have had friends. They played one-on-one with neighbor kids, were on soccer teams, and made friends at church. As they've gotten older they've developed friendships with other homeschoolers, often those who live elsewhere that they met through Higher Things or other church-related functions. But the social activities that they've been a part of have been family-oriented. They have been socialized by our family and friends. They have been socialized by adults who we like and admire and have chosen to spend time with. I firmly believe that one of the worst aspects of conventional schooling is the division by age and the imposition of barriers between child and family. As a result of our not being group-oriented, I think we have missed out on some of the attitudes and behaviors that come from kids socializing each other. They grew up socializing freely with those older and younger than them. They didn't learn that their parents are uncool know-nothings and that younger siblings were pests to be avoided. As I said, we've had help. Our older kids have helped socialize the younger ones. I love seeing Patrick's civilizing influence on his younger brothers. Their grandparents and other relatives have had their parts. The hours that the kids have spent in the company of various pastors, both formally and informally, has had a tremendous influence on their thinking. Being a part of the life of the church, trained and useful, as acolytes has helped the boys to deal with the forced uselessness of that time society calls adolescence. The women who are my friends have had a profound impact on my kids. I love it when I see a glimpse of Susan, or Lora, or Lori, or Jacqui--and these are just the glimpses I see the most--in something one of the kids says. So that's my answer, I'm not saying other choices are wrong, but I've been asked what we've done. And this is it. One of the ideas that Gatto mentioned that has really tickled my brain is that of "style." It was in the context of communication ability and how connections and associations provide opportunities. He talked about how freedom and play lead to the development of individual style, and that a distinctive style is priceless. My immediate reaction was to think about my oldest son, not to the exclusion of the others, but because he has such a strong personal style. My thoughts then wandered through each of my own children and on to some of those of my friends. They each have it. They each have a uniqueness of expression that comes out in myriad ways: speech, writing, dress, interests, hobbies, musical preferences, college and career choices, and more. They are all comfortable in their own skins. What a gift! I don't think I achieved any level of comfort in my skin, any real personal style, until I was in my mid-30's. My daughter's writing as a college freshmen showed an ease of expression that all of my fevered attempts couldn't achieve. My 16 year old wears a hat--not a baseball cap--and wears it with panache and proper etiquette, because it brings him joy. Because part of my eldest son's personal style is a level of good manners seldom seen in most adult men today, he makes friends everywhere he goes. And it has rubbed off on his brothers--another post is coming...--which has helped them to make connections of many sorts, all of which enrich their lives in some way. School squelches style. That's part of its job. You see it in the appearance of the girls going into freshman composition classes on a college campus: droves of straightened bleached hair, make up, tight jeans, tight t-shirts, flip-flops, slouched shoulders and a shuffling flip-flop walk. You hear it in the conversations. Those who dare maintain their own style in high school are usually the outcasts of one sort or another. I loved Gatto's idea that style comes from play. I see it. In each of my kids I see echoes of their amusements in their personal styles. I see echoes of the world of Dyger, created by them when they were littles. I see and hear the influences of Jane Austen, Tolkein, and Dr. Seuss. I notice echoes of Darkwing Duck, Barbies & Legos, and the Zoombinis. I see Haydn and Beethoven and Clementi and Rush and Boston and Joseph's Dreamcoat and Les Miserables. And in their movements I see hours of soccer. It makes me glad that my kids have had lots of freedom. And that's another post. I had a new experience on Friday. After 14 years of homeschooling, and 12 as a committed unschooler--the first two were spent trying to figure out what we were doing--I was in a situation where being an unschooler was applauded. Wow. John Taylor Gatto, former New York Teacher of the Year, was applauding unschooling parents. I've spent years feeling like I needed to defend what I was doing with my kids. Even as our results have proved that unschooling works, I have experienced a doubling-down of criticism, especially from other homeschoolers. I've never asked for atta-girls, or pats on the back; so I was stunned by how nice it was to get that unsolicited affirmation. We live with "a palette of unexamined assumptions" including the idea that "lurking behind anything worthwhile is standardized tests, GPAs and college." These assumptions have "allowed us to become our own jailers." Wow, again. This is so true, and echoes many of the conversations that I've had in the past few years with people who think about education. Gatto pointed out that it is still true that many highly successful people--names everyone knows: Gates, Jobs, Dell, to name but a few--didn't go to college or dropped out. We have come to value credentials over learning, and hoop-jumping over knowledge and understanding. And it is imprisoning millions in a cycle of under-achieving when they don't measure up and student loan debt when they do. The way to break out: "There has to be a substantial amount of your educational program that only fits you." This is the key to unschooling. It is absolutely personalized. And it cannot be done in institutional school. It is not what institutional schooling is for. That has a different purpose. This doesn't preclude college. In fact, so far both of my unschooled high school graduates have chosen to attend college, because it fits them. Both have chosen to be history majors, one added a minor in English, the other is considering German and political science as possible minors. But that is another post. I think Gatto's quote also challenges us to consider what is "worthwhile." Our society seems to consider only material or career success as worthy of pursuit. I would argue that there are other pursuits equally worthwhile, which do not depend on tests and GPAs. Parenting, growing food, and working with the hands come to mind, as a beginning. Almost exactly a year ago, I posted some thoughts that I had upon reading John Taylor Gatto's Weapons of Mass Instruction. Gatto has long helped bolster the "why" of our homeschool adventure. Last weekend I had the opportunity to attend a homeschool conference where he was speaking. The session was way too short, but I did glean a lot from his talk. I think it's going to make its way into a number of blog posts. If you are a fan of conventional, institutional schooling, I'll again warn that you may not like what I'm going to say. I used to be a fan, but not any more. Gatto has done copious amounts of research into the history and background of American education. His many years as a teacher in public schools gave him a front row seat. So what's the bottom line? Our government schools exist for the express purposes of destroying the imagination, weakening family ties, and separating children from their parents. They exist to create willing, unquestioning workers and consumers. Learning is incidental. This is the background. The next few posts will include things that Gatto said and things that I've been thinking, and how they have connected. Added: My friend Cheryl has some thoughts on Gatto, his book, and schools. Patrick has a great post on the trade-offs we make when we take the government's money, or ask them to cushion life's blows. Jumping off from his post, I must ask: Why would homeschoolers wish to push for government money? I understand that we pay school taxes, but so do the elderly, the childless, the parents of private school children. Whether we think it is a good thing or not, schools are something that our fellow citizens consider worthy of supporting with tax dollars, so we pay the taxes and choose not to use the schools. That is a choice we make freely. I also understand that we often spend money that other parents don't need to spend, and that most of us could use a little more money, but again, this spending is a result of our choice. What many people tend to forget in their hopes for a tax credit, or rebate, or stipend is that government money always comes with strings. And yes, you could argue that you've paid taxes so you're just keeping your money. I agree. But the government doesn't look at it that way. Once it's been moved into their column on the balance sheet, they consider it theirs. There will be strings, rules, and requirements, which are some of the things that many of us hoped to avoid by homeschooling. I wrote back in the fall about my frustration with the lies liberals tell about those with whom they disagree about health care. It is true in other areas, but seems magnified in that discussion. It hasn't gotten any better. As the Democrats continue to try to push through their monstrosity of a bill, against the will of the American people, their defenders get more angry. They continue to call conservatives selfish, greedy, and stupid. They continue to make it sound like this bill is the only chance to make changes in our health care system. But they refuse to engage in a logical, reasonable discussion about the facts of our health care system and the ways that the proposed legislation does or does not address them. In response to facts about the current system, they respond with anecdotal sad stories. "People are dying!" But the fact is, people die under every health care system, and will continue to die, whatever reforms may come. That's part of life this side of Heaven. Stories aren't facts. As part of this same tactic, they assume that those who disagree with them have never experienced poverty, an illness without insurance, having to go without treatment, or other elements of the stories they tell. They are wrong. In response to arguments about the specific problems with this plan we get cries of "Selfish!" or "Talking points!" Of course, if they would READ the bill they would see that some talking points are true. If they would be open to the reality that some of the "facts" that whirl around in the media echo chamber are, in fact, false and would look beyond the Huffington Post, Daily Kos, MSNBC, and NY Times for their "news," they might learn that all is not as they have believed. Because that's what we're dealing with, in many cases. Belief. A nearly religious belief in the truth of the claims of the sages of the left and the rightness of ramming through THIS legislation no matter the cost to our society. They don't care about the evidence from studies that refute many of the tenets of their faith about who the uninsured are, how their health is impacted, and what the many factors in the high cost of health care are. They don't care about the facts behind the numbers in the widely touted World Health Organization rankings. They don't care about the many economists and experts who agree that this plan leaves many fundamental issues untouched and creates new problems. They refuse to acknowledge the problems endemic to many government run health systems. They're like children sticking their fingers in their ears while yelling: "Selfish!!" "Partisan!" "Stupid!" "Insurance companies!" "Teabagger!" and always when they can't come up with anything else, "Well, BUSH...."
I've nearly given up on trying. The frustration of trying to discuss with people who refuse to even address facts is almost too much. And yet, this is too important to give up. If even one person who is wavering actually looks at the facts, then it won't have been in vain. Postscript: This doesn't mean that I don't believe that there are liberals with well-thought out ideas and arguments for them. I'm just not seeing any of them. I read the book Second Nature by Michael Pollan and did a very rudimentary review of it, but here's a better review by my friend RPW. I keep having ideas for blog posts, but they come at the most inconvenient times and fly away before I can write them down. Maybe it's because I am spending so much time in the car. Hours, every day, spent in driving or sitting and waiting for Jonathan while he rehearses for one of his two upcoming musicals. Maybe I can't hold onto a thought because I am too tired. Brain-fuzzed. I've been getting too little sleep and too little good, nutritious food. Being home only to sleep will do that. And then when I do have a bit of time at home, I'm not likely to use it to blog, or even check Facebook. I use it to cook something that everyone can eat while I'm gone, or to clean just a bit to hold the ever-encroaching chaos at bay. Is it worth it? Probably so. Jonathan is having a huge amount of fun, especially rehearsing for Joseph at the Civic Theatre. He's also getting a lot of experience and making more connections. When we are working on college applications, he is going to have a lot of varied singing experience. And it's just this intense for a couple of months. I am signing him up for Driver's Ed as soon as this is over. "They lived a cloistered, segregated, and selfish life, much like Ivy League professors today." Spring is just around the corner. Right? Please? This is the time of year when the packed down, turned-to-ice snow is a major danger to someone as graceful (not) as I am. It is the time of year when I know, intellectually, that the amount of daylight is growing each day, but the cloud cover keeps me from believing it. And, this is the time of year that said cloud cover makes me long for just a few precious rays of sun. I found myself wondering many things last night as I listened to the State of the Union address. I wondered if this is what our founders had in mind. An hour or more of partisan rhetoric and a laundry list of ways to spend our money, along with an attack on the Supreme Court, and well over 100 references to self instead of country doesn't seem like what they had in mind with, "He [the President] shall from time to time give to Congress information of the State of the Union and recommend to their Consideration such measures as he shall judge necessary and expedient." Of course, the Congress--supposedly the recipient of the report--is now just a prop as the president plays to the camera and talks to the American people. I found myself wondering what it would feel like to be able--inwardly--to stand up and lie in front of millions of people. Multiple times. And to obfuscate, blur, overstate, understate, and--did I mention--lie? To parse a phrase so that it might be technically, possibly, not absolutely false, but also certainly not true? The AP covers the most obvious today, but in many ways the tone and message of the speech was one sustained lie. I wondered how much of what he was saying he believed. And then I saw when the passion kicked in. He found his passion when he was blaming, talking down to, or excoriating others. I found myself wondering whether the president, with his vaunted Ivy League education, has read any economics or history. I found myself wondering whether he is really as out of touch with average Americans as he appears, or if he is too stubborn, or as some have posited, narcissistic, to believe that anyone--let alone tens of millions--can disagree with him. And I wondered once again, how on earth we got to this point, and if we will come out of it with our country intact. I'm a reader. Even when I'm driving, I'm a reader. So I notice bumper stickers and license plates to what I am told is an unusual degree. So, I can say with a great deal of confidence that there were a far greater than average number of "arts" and "environmental" license plates in the lot when I dropped Jonathan off for rehearsal last night. My van was the right choice for the evening, since it sports the environmental license plate, supporting the Indiana Department of Natural Resources. 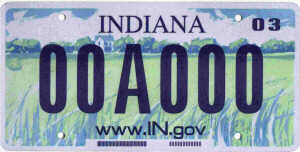 Specialty license plates in Indiana went through a boom a few years back when the regular plate was ugly. Now, with a more attractive regular plate, and the "In God We Trust" option, you don't see as many specialty plates around, so the concentration of them in that parking lot showed me that these were people who would put their money where their mouths were. Of course, bumper stickers are the most obvious car speech. I'm noticing a trend. The Obama/Biden hopeychangey bumper stickers are disappearing. Quickly. There are cars that I recognize because I see them often that have recently dropped them. I've noticed that the saturation in the campus parking lot is way down. What does this mean? Buyer's remorse, maybe? I'll continue watching this trend. Yesterday as I was driving home, I heard a guy call in to a local radio show, the Pat White Show. I don't know why I listen. I think it's because I find things out about local politics and events that I might miss otherwise, but every show is a form of torture. Pat has a few unidiomatic stock phrases that drive me batty. He seems to have about four talking points for each topic that he repeats in response to callers, whether they make sense or not. And he has the peculiar stubborn ignorance of those who have almost no information, but know what they know. Anyway. Last night's gem of colossal ignorance was arguing that before the American people send money to Haiti they need to take care of things here. That people here are in a "hard time" and that money shouldn't be going overseas. Excuse me? Even before the earthquake, Haiti was a land of horrible poverty. I don't think most Americans--and certainly not the caller, calling from his CELLPHONE in his CAR--understand what true, barely surviving, poverty means. When the poor here have TVs, cell-phones, and grab a happy meal at McDonald's for their kids, we have a warped view of what hunger, deprivation, and want mean. And I hope we remain removed from those things, although I fear that we won't. How can anyone with a heart see the pictures coming from Haiti and hear of the people dead and dying and not wish to help? I know there are some people in our country who are in financial hard times and instability. They needn't feel guilty if they can't help the Haitians monetarily. If they are making a choice between feeding their families or sending money to Haiti, they need to feed their families. But for those of us who are choosing between two lattes or texting a $10 donation to Haiti, or a nice dinner out and sending $100 to Lutheran world Relief or the American Red Cross...well, the Haitians need our help. And that doesn't preclude helping out someone here at home who is in need, too. My schedule is currently such that I am away from home most of the day. I'm doing a lot of driving and a lot of sitting in the car and waiting. These waits are short enough that there is no way to conveniently get errands or other useful tasks done. It frustrates me, because I feel like I'm losing huge chunks of time and getting behind on things I need to do, but I am finding a bright side. I am getting tons of reading done! Usually much of my reading in done in small bits of snatched time. I read while I am making my coffee, drying my hair, waiting for a train or in line at the grocery store. (This is what a bookaholic does for a fix.) So a forty-five minute reading opportunity in a parking lot seems almost decadent. It's been especially nice this week because it's been sunny and I've soaked up the rays through my car window while I read. So, while I am feeling angst over my never-home, crazy, driving all over town schedule, I am also flying through the books. Definitely a silver lining. I've decided that I need to get back to writing here. I need the mental outlet. I need the spot to say what I want to say. And writing keeps me sane. Right now I'm sitting here with my oldest son. I am listening to him as he does his reading for his American history class. He is about to lose it as he reads the textbook overflowing with Marxist pap. He's reading it for the class that is being taught by a professor who characterized the KKK as a "far-right" group. Uh-huh. You mean the KKK that basically served as a paramilitary arm of the Democratic party? I love it that he KNOWS and understands enough about history, political philosophy, and the world that he can recognize what he's reading and hearing for what it is. I love it that he has been reading critically, both things he agrees with and things that he doesn't, for years. He recognizes strong arguments and can eviscerate weak ones. I love it. I really do. As with last year, I was relieved to look back tonight and see that I had made no resolutions. What a relief! I did, however, have a few reading challenges to complete. While I was mostly successful, I came up slightly short. Update: For a more thoughtful look at resolutions: Wit & Whim. As I sit here with my family and my flute of Asti, watching the partiers in Times Square, I am torn between looking forward to the New Year and being apprehensive about what it holds. For tonight, I'm going with hopeful. That may change.